Gunakan biaya penemuan top 5 strengths (kekuatan) Anda untuk mengungkapkan 34 strengths (kekuatan) dari profil strengths (kekuatan) lengkapAnda. Pahami cara memaksimalkan efektivitas Anda, mengenali strenghts (kekuatan) pada orang lain, dan meraih kesuksesan. Opsi peningkatan ini adalah bagi mereka yang telah menemukan top 5 strengths (kekuatan) mereka, termasuk semua produk dalam Akses All 34 Strengths (Kekuatan). NEW! 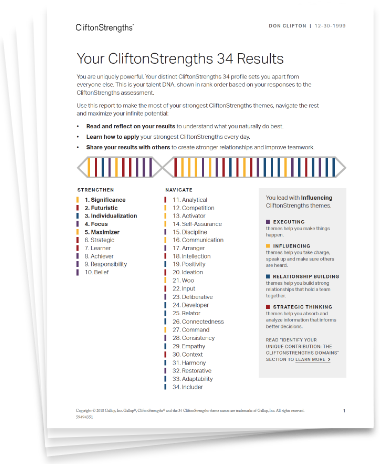 CliftonStrengths 34 Report. Only CliftonStrengths 34 provides you with this in-depth, self-paced coaching report. This personalized report teaches you how to make the most of your strongest CliftonStrengths and how to understand your full CliftonStrengths profile. NEW! "" E-Learning Module. This interactive e-learning experience is the first step on your CliftonStrengths journey. During this 20-minute online module, you will use your personalized CliftonStrengths 34 results to learn how you can achieve your potential by doing what you naturally do best. Strengths Insight Report. Get in-depth analysis of your top 5 CliftonStrengths. Unique to your specific combination of CliftonStrengths, this report describes who you are in astonishing detail and tells you what makes you stand out. More tools and resources. Dive deeper into strengths-based development with your complimentary electronic copy of StrengthsFinder 2.0 and other supporting materials. Redeem your Upgrade to CliftonStrengths 34 access code. Log in to the account you use to access your Top 5 CliftonStrengths results. Start using your newly unlocked CliftonStrengths results and resources to maximize your potential.